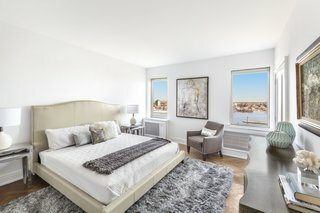 Once home to legendary American songwriter Irving Berlin—who brought us "God Bless America" and "There’s No Business Like Show Business"—130 East End Avenue is a penthouse duplex with breathtaking views, located just above the Upper East Side in Yorkville. The composer moved into the duplex in 1931 at the age of 43, along with his family. At the time, Berlin—who wrote hundreds of hits over the course of his career—was already famous for songs like "Puttin’ on the Ritz" and "Blue Skies," and he went on to write "I’ve Got My Love to Keep Me Warm," and "Say It Isn’t So." In fact, he penned the infamous "God Bless America" during the time he spent living in this apartment. 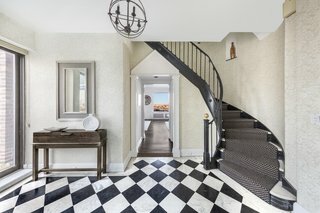 The duplex features a dramatic black-and-white entry with a glamorous circular staircase. 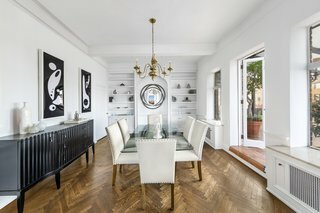 The home has been refreshed since the time Berlin lived in it, and the light-filled duplex now features classic architectural details, high ceilings, and a dramatic black-and-white entry. A circular staircase leads to a spacious living room with five picture windows that frame sweeping views of the surroundings. Other highlights include the formal dining room with an adjoining sunroom, which leads to a wraparound terrace and a sunny study/guest room with access to an upper terrace. 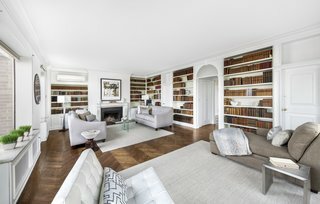 The 28-foot corner living room features built-in bookshelves, a wood-burning fireplace, and the original herringbone floor. 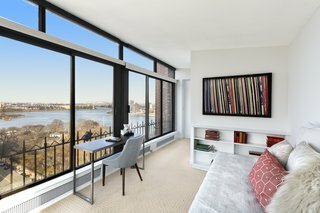 Five windows provide sweeping views of the surroundings. The light-filled dining room has an adjoining sunroom, which connects to a wraparound terrace. The circular staircase leads to two upstairs bedrooms, both with spectacular views. The upper level holds two bathrooms and a study/guest room with access to a large, private roof terrace. 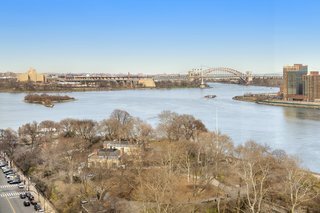 A peek at the penthouse's unobstructed river, park, and bridge views. 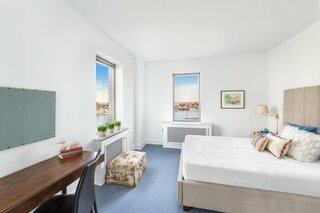 130 East End Avenue, Apt. PHA is currently listed for $3,995,000 by Jane R. Andrews of Warburg Realty.